No purchase necessary. A purchase will not improve chances of winning. 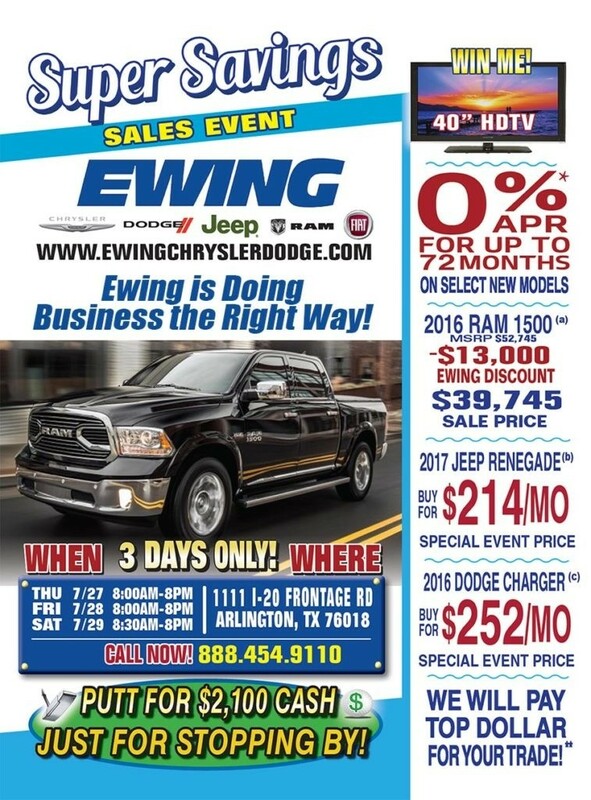 Employees of Ewing Chrysler Dodge Jeep Ram Fiat and family members are NOT eligible for prizes. Winners must be 18 years or older with a valid driver’s license and a social security card. Winners are responsible for all taxes. Valued Gift cannot be exchanged for cash. Grand Prize Winner will have a choice of $20,000 or a New 2017 Jeep Renegade. Non transferable. Void where prohibited. Prizes 1,11,111, and Grand Prize odds of winning 1:11,000. Prize IV odds of winning 10,996:11,000. Contest Promoters ASPM. *0% is available for 72 months. Example: $13.89 per month per $1,000. (a) Manufacturer’s Rebate subject to residency restrictions. Any customer not meeting the residency restrictions will receive a dealer discount in the same amount of the manufacturer’s rebate. Two remaining: Stk# R318406 & R330148, WAC. Thru 8-1-17. See dealer for further details. (b) Stk#: JF09433. ;· MSRP: $22,540 – $541 Dealer Discount – $500 Factory Bonus Cash – $2,500 Factory Retail Customer Cash. Sale Price: $19,089. 20% down payment. 1.9% APR for 72 months. Must take retail delivery by 07/31/2017. Plus TT&L/Fees. WAC. Thru 7/31 /17. (c) Stk#: 0310479, 0310477, 031047 4, 0310480. MSRP $28,990 -g $6,000 Dealer Discounts. Sale Price: $22,990. 20% Down Payment. 1.9% APR for 72 months. Must take g retail delivery by 07/31/2017. Plus TT&UFees. WAC. Thru 7/31/17. All sales prices plus tax, title, license, and g $150.00 doc fee. **Deductions from trade allowance may be made for mechanical failures, interior/body 0 damage, reconditioning costs and or excessive mileage. Supplemental cash may be required if loan balance exceeds actual cash value. Any negative equity may be applied to amount financed. This sale supersedes all other advertised sales.